500/1 Guitars | Fretted Americana Inc. 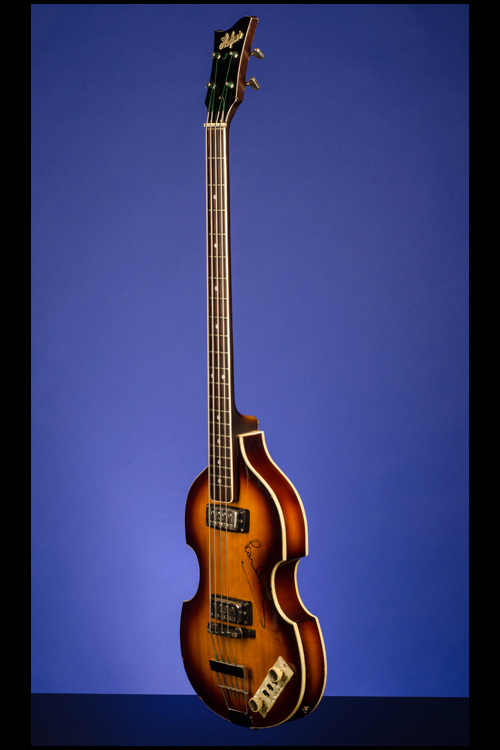 This near mint and original 1965/1966 Hofner 500/1 "Violin" bass weighs just 4.50 lbs and has a just over two-inch thick, eleven inch wide, 'violin' shaped full hollow-body. 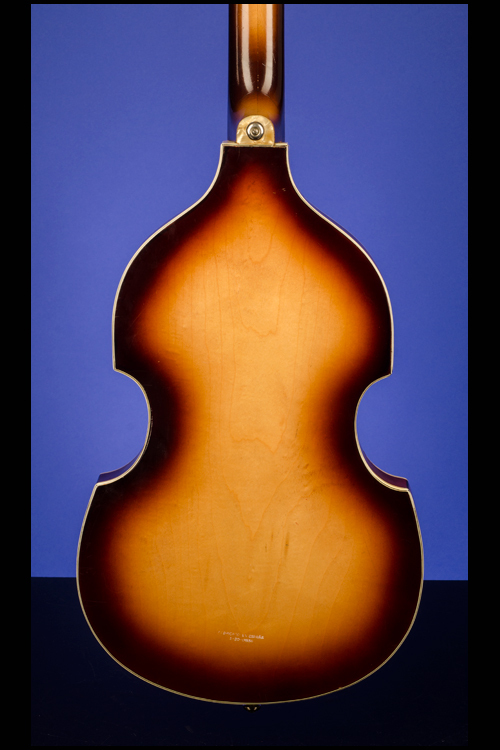 Arched one-piece spruce top, arched one-piece laminated 'flamed' maple back and triple-bound laminated maple sides. Two-piece flamed maple neck (similar to the bass that McCartney plays today) with a nut width of just over 1 9/16 inches and a comfortable medium-thick profile. Single-layer pearloid heel-cap with added strap button. Rosewood fretboard with a five-piece nut, a 'zero' fret and twenty-one original 'medium-thin' frets and mother-of-pearl dot position markers. 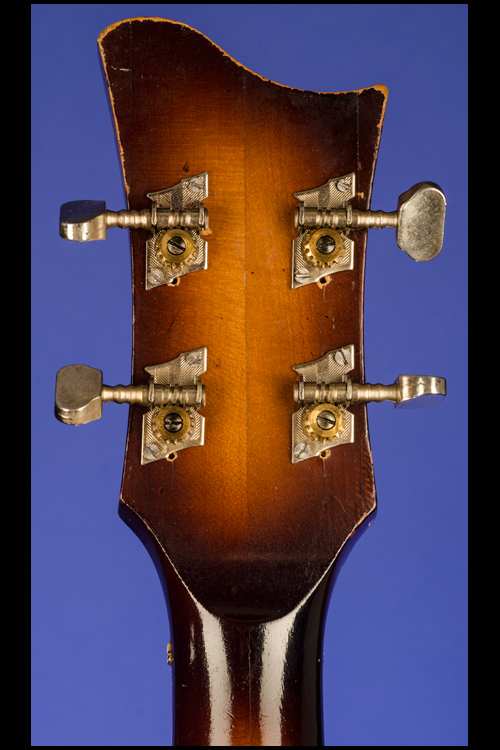 (Replaced - period correct) individual open-back tuners with scalloped metal buttons. Black laminated headstock face with 'raised' Hofner script peghead logo in white plastic with gold face. Two Höfner Type 511 "Super" staple single-coil pickups with outputs of 4.36k and 4.51k. Two 'rotary' volume controls and three two-way 'slider' switches for "Rhythm/Solo", "Bass" and "Treble". Hofner 'teacup' control knobs with ribbed sides and metal tops, all on a 'thin' rectangular mother-of-pearl panel with black edging. 'Floating' four-saddle ebony bridge with ebony base with four 'friction-fit' moveable saddles. Hofner specific nickel 'trapeze' style tailpiece. Housed in a new four-latch, shaped black hardshell case with black plush lining (9.50). This guitar is a Spanish model from ca. 1965/66 with "Fabrica en Espana / A-20-01536" stamped in white on the back of the body. Inside the control panel, on the back of the body, written in black ink is "Jose Luis Precioso 50.827646." 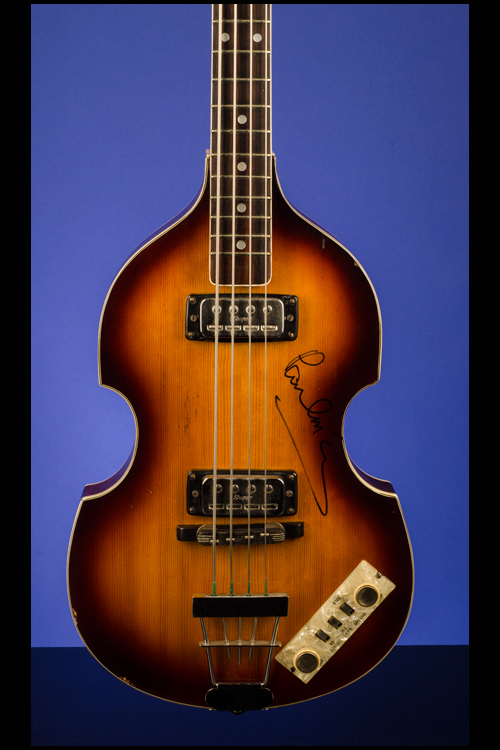 This McCartney 'Beatle' Bass is signed on the top in black marker pen by Sir Paul McCartney. "Madrid 3/5/2015. On the morning of October 26, 1993, I left from my Madrid City (Spain) trip to Barcelona, with the purpose of meeting Paul McCartney upon arrival at the airport of Shower City, where at night and the next day 27, Paul offered two concerts inside it’s... ”The New World Tour”. 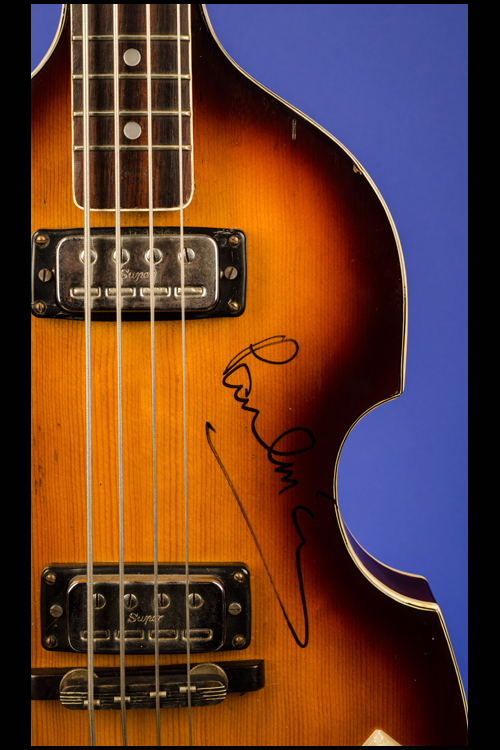 On his previous visit to our country, in 1989 [Madrid, 2nd or 3rd November], I got to the signed me one of my bass Hofner. So went to Barcelona with other two basses, a 501 and a club in the trunk of the car. This time I had a friend as a member of the “Guardia Civil”, as a fan of Paul and that eventually I facilitated my purpose. We arrived in Barcelona very soon, and we headed straight to the airport. Not had no idea at that time would come Paul and his band, in the terminal after speaking with members of the Guardia Civil responsible for customs and private flights. As a favor, we get pass to international ground... now because it was only a matter of waiting!! Memory view from my privileged position, as it is riding the safety device, as well as the arrival of many fans it was without a doubt, indicative of the arrival of Paul!! And when expected arrived, but not before that any discussion by the private Paul security team to ask that to me there with two basses. Paul made his appearance of the arm of Linda, and after a warning to one of his bodyguards was headed directly towards me at the same time that said in perfect Spanish: - “Solo dos amigo?” - (Only two, my friend?) And then stamping his signature first in the “Club” and then the “501”. 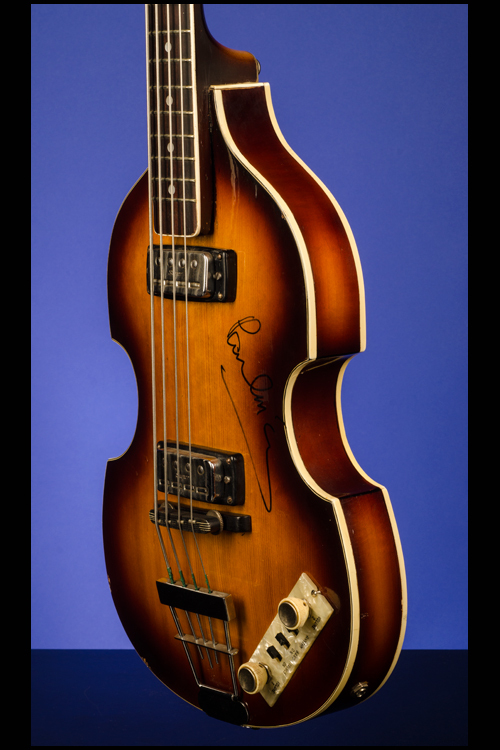 I got have three Hofner signed by Paul and more important, to be near and greet. Last time, and for reasons economic, I desire of them, but that is another day... Madrid 3/Mayo/2015 [Signed] Jose Luis Precioso." Also included are several photographs of Jose Luis Precioso with Paul and Linda McCartney, Jose Luis Precioso playing the guitar and the guitar itself after having been signed by McCartney. 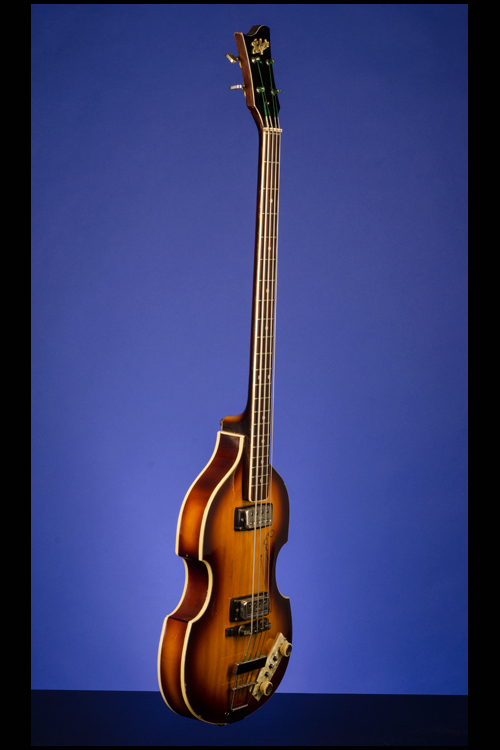 During the 1960's and 1970's, in addition to the German factory production, Hofner also made guitars and basses in a factory in Zarauz located in the vasque country in Spain. This bass was made in this factory and has "Fabrica en Espana / A-20-01536" stamped in white on the back of the body. The Paul McCartney World Tour was a worldwide concert tour by Paul McCartney during 1989 and 1990. It was McCartney's first major tour outing in ten years, since the Wings UK Tour in 1979, and his first appearances in North America in thirteen years, since the 1976 Wings Over America Tour. It was also his first tour under his name. While the tour coincided with the release of his Flowers in the Dirt album, it was thematically more about his finally embracing his Beatles past, including for the first time, in any of his tours, a substantial number of Beatles songs in the set list. The tour was documented by the 1990 live albums Tripping the Live Fantastic, Tripping the Live Fantastic: Highlights!, and the 1991 film Get Back. A one-hour tour documentary was also aired on Channel 4 TV in the UK, called "From Rio to Liverpool"
In 1997 Sir Paul McCartney (born 18th June 1942) was knighted by Queen Elizabeth II for his services to music. 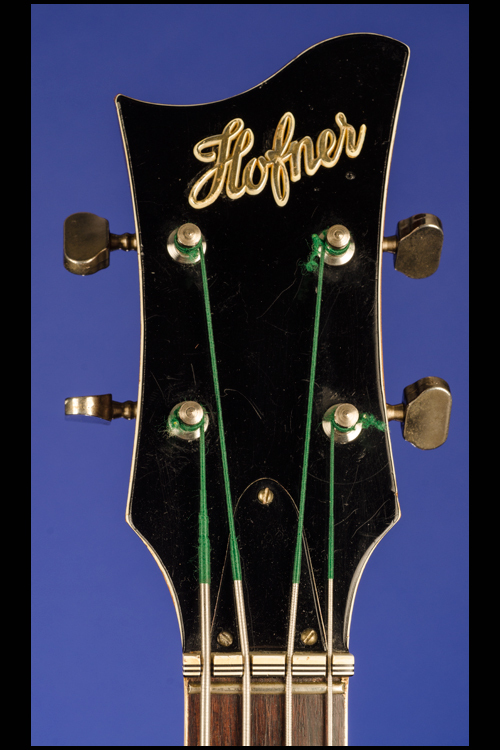 "Founded in Schonbach in 1887 by master luthier Karl Hofner, the company became the largest manufacturer of stringed and fretted instruments in Germany. Craft skills and business initiative laid the foundation for a reputation that, even before World War I, extended far beyond the borders of Germany. His two sons, Josef and Walter, joined their father's company in 1919 and 1921 respectively. 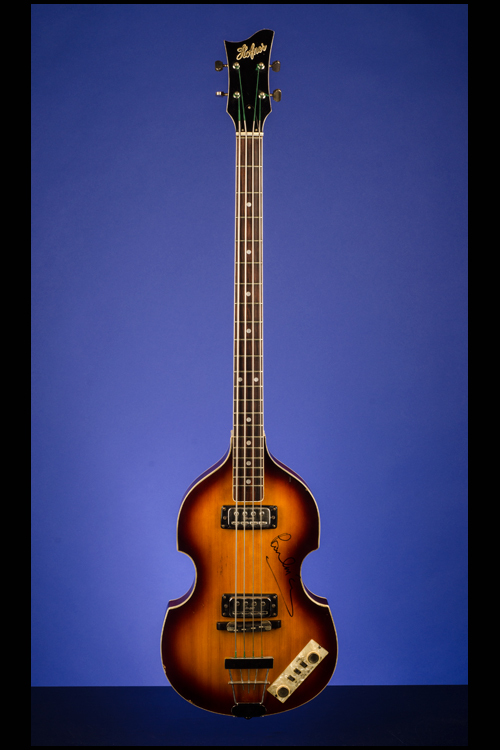 They successfully expanded Hofner's worldwide market, enabling them to survive the years of recovery, which marked the phase after World War II and the related resettlement from the "Sudetenland" to Bavaria. In 1950, new production facilities were built in Bubenreuth. 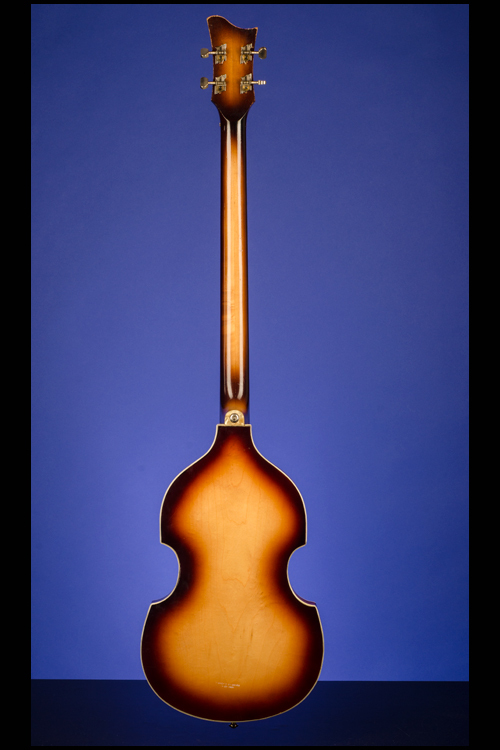 To date, more than two million stringed and fretted instruments - from student to master models - have been produced, 75% of which have been exported worldwide, emphasising the outstanding position enjoyed by Karl Hofner GmbH in the world market.The product range of Hofner is extensive and not only confined to stringed instruments and classical guitars. In 1955, Walter Hofner, a creative businessman as well as a violin and guitar maker, invented an electrically amplified semi-acoustic bass. The distinctive 500/1 bass was launched at the 1956 Frankfurt Music Fair and subsequently rose to fame under a different name. 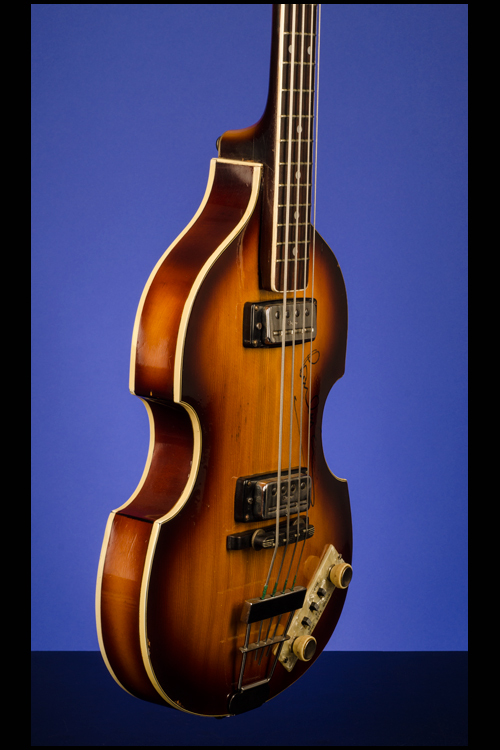 In 1961, Paul McCartney bought his first Hofner bass in a shop in Hamburg and used it on many of the Beatles' most famous songs. 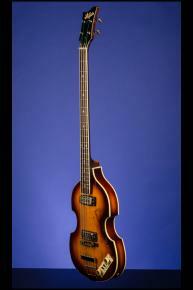 Paul still plays his "Beatle Bass" live on stage today."